A new season and once again the doors to the House of Horrors are open. One week of Premier League action and already we have players putting themselves up to be blacklisted. Alex Song (Arsenal) - A coward and a disgrace. The Arsenal midfield opted to viciously stamp on Joey Barton's leg in an unprovoked assault. Disgusting behavior that shows the nasty mindset of this individual. No place in the game for this sort player. Ryan Shawcross (Stoke) - Straight back on the list after one week of football. Shawcross is an animal lacking in self control. Less than ten minutes gone against Chelsea and he was in the book for flying right through the back of Fernando Torres, having not quite got him at the first time of asking moments earlier. It's only a matter of time before Shawcross adds another long term injury victim to his tally after seeing promising Arsenal youngster Aaron Ramsey out for months with a shocking tackle last year. Xabi Alonso (Real Madrid) - Often seen as the victim, Alonso gives at least as good as he gets. Sunday night saw him leave the ground on several occasions against Barcelona in the Spanish equivalent of the Charity Shield. Unfortunately Alonso tends not to get the ball often enough and therefore ends up flying through opposition players. Add that to the late tackles and the fact he likes to engage in a bit of afters once the ball is gone and he can thank himself lucky he's in a Real Madrid shirt as it appears to draw him extra leniency from referees. Marcelo (Real Madrid) - Like Alonso above he just can't seem to stay on his feet. Again though he benefits from the shirt he wears as it seems to allow him to get away with more than he should. An assault on Pedro in the penalty area was waved away despite Marcelo leaving the ground, getting none of the ball and a good chunk of Pedro's legs. A vicious individual with an inability to tackle properly making him a dangerous player for all the wrong reasons. Marcelo (Real Madrid) - Reinforcing his induction into the House of Horrors at the weekend, the Real Madrid full back was sent from the field of play in the closing minutes at the Camp Nou. True to form it was a vicious assault with the Brazilian leaving the ground to fly through the back of Cesc Fabregas right in front of both benches. A horrific and highly dangerous tackle that sparked a mass brawl between both sets of players and benches. Pepe (Real Madrid) - It was only a matter of time until the Portuguese centre half joined his team mates. A good player with a strong challenge but also a real nasty streak and a tendency to display it all too often. His particular favourite is leaving a boot in after a tackle to bring a player down or even better, throwing an arm or elbow to make contact with a player's face. Three times last night he was shown in replays to catch a player with a trailing arm suspiciously thrown right in their face. Curiously Pepe tends to resort to these tactics as he starts to get tired. His intend seems to be to threaten the opposition with his bully boy tactics and tackles that suggest an intent to injure his opponents. No place on the pitch for a player with this mentality. Lee Cattermole (Sunderland) - The Sunderland captain made it to week two before the nasty side of his game popped up in the derby match with Newcastle at the Stadium of Light. Unable to control his 'competitive' side Cattermole went a whole 16 minutes before crashing through Joey Barton well after the ball was gone. Lenient referee Howard Webb let him away with what was surely a bookable offence but Cattermole made sure his name went in the book during the second half with what can only be described as an assault on Joans Gutierrez. The Argentine had taken the ball well clear of Cattermole who in frustration just decided to chop Gutierrez down with a vicious challenge from behind. How he escaped a red card is beyond belief but he did manage to spark a riot that saw both sides involved and end up with Barton and Bardsley getting booked. Cattermole is an average player at best who seems to have a license to go around kicking opposition players off the pitch. Sunderland fans themselves don't want him in the team nevermind have him as captain. A player the Premier League would be a much better place without. Phil Bardsley (Sunderland) - An absolutely shocking tackle on Coloccini at the end of the derby fixture. Some Sunderland fans are calling it 50/50 and claiming he got the ball. None of which matters when the player goes in studs up on the standing leg of his victim with a tackle that has seen various players leave the field on a stretcher with a broken leg in the last few seasons. Unbelievably the terrible refereeing of Howard Webb deemed it to be only a yellow card offence! Bardsley walked anyway following an earlier booking for losing his temper and engaging in handbags with Joey Barton over a shocking Lee Cattermole challenge. This sort of x-rated challenge has no place in football and any player who displays the recklessness and lack of concern for a fellow professional to engage in such a tackle shouldn't be on the pitch in the first place. Lets just add Kevin Davies into this. 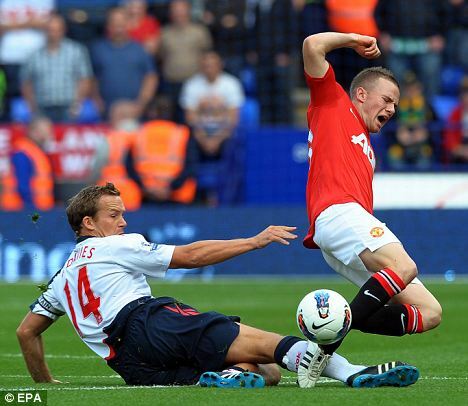 He received his 100th Premier League booking yesterday for this vicous tackle on young Tom Cleverley which has resulted in him breaking his foot and being out for 3 months recovery. Kevin Davies is the most persistent fouler in the Premier League but has never been sent off. Comments (9) Add to My Stories Share Manchester United midfielder Tom Cleverley could be out for three months as a result of Bolton's rough-house treatment at the Reebok Stadium. 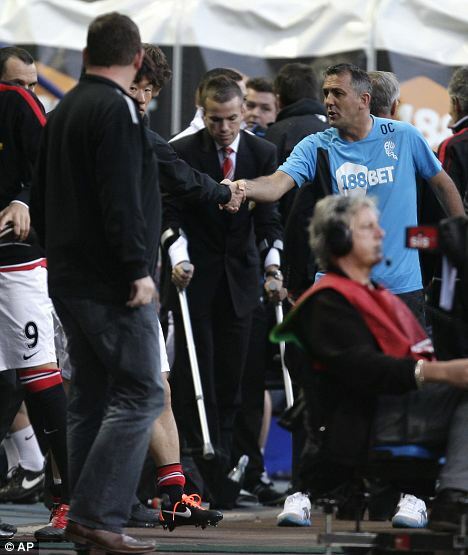 He limped out of United's 5-0 victory after only seven minutes following a bad tackle by striker Kevin Davies. It is a blow to Cleverley, who has been one of the club's brightest performers in their unbeaten start to the season and who has forced his way into the England squad. And there were further injury scares for Patrice Evra and Jonny Evans, to leave Sir Alex Ferguson angry at Bolton's approach. Cleverley left the ground with a protective boot and his injury took some of the gloss off a victory that kept United top, after four wins out of four. Ferguson was angry after Bolton skipper Davies picked up his 100th booking - a tally second only to Lee Bowyer in the Premier League. Cleverley was always going to be rested for United's Champions League trip to Benfica on Wednesday and Ferguson is set to introduce experienced stars like Darren Fletcher and Ryan Giggs, with youngsters including Phil Jones making way. Ferguson, whose side were beaten at Benfica's Stadium of Light in 2005, said: 'Experience is important and that is why my team might be different in Lisbon. 'Benfica-United has a ring to it because of the history. But it's an important game in its own right. Whoever wins gets a valuable headstart in the group. 'There's no doubt the younger players will get good experience in the Champions League this season, but the important thing is to qualify. The home games will be better for them. Sorry Josh, you are right, my mistake. The thing I dislike about that tackle from Kevin Davies on Cleverley is that it is so typical of what happens in grass roots football every match I watch and should be outlawed from the game. Cleverley has the ball at his feet looking forward to pass it, Davies flies in from behind straight through Cleverley in an attempt to get to the ball. You can then see Davies go to the referee and claim he got the ball. Actually in this case he didn't but that is irrelevant. Alan Shearer on MotD blandly calls it clumsy. I would call it reckless and dangerous. Personally I would never tackle anyone by closing my eyes and just launching at them. The usual cry at local league level by the thugs who tackle like that is "I got the ball ref". True, but only after you had broken the other blokes leg first. Time for referees at all levels to take a hard line on these launched tackles and start showing more red cards. Then we'll have the skillful players on the pitch playing instead of in hospital and the thugs in the stands where they belong. Charlie Adam (Liverpool) - After a shocking assault on Gareth Bale whilst wearing the Blackpool colours last season, Adam has continued to demonstrate his lack of concern for the safety of opponents with another poor tackle against a Tottenham player, this time Scott Parker. Lunging in, studs up, boot connecting above the shin pad and below the knee but somehow only a yellow card was shown. Thankfully Adam had already been booked and was promptly sent off however the challenge was easily worthy of a red card. Charlie Mulgrew (Celtic) - Old Firm games tend to be more about bad tackles and off the field spats than sublime football so it's little shock to see a new player added to the House of Horrors from the SPL this weekend. Mulgrew's first challenge saw him go right through the back of Naismith long after the ball was gone and he was fortunate to be the first in the book as it was the sort of tackle that has seen players sent off in the Premier League. The sending off saw him leave the ground, flying in over the top of the ball and taking out Davis. In other leagues again a straight sending off but this time only a booking. Vicious and no place for that sort of tackle in the modern game. We've seen it break legs before. The football has been dire at Villa Park since Alex McLeish has arrived and despite having a season ticket I have chosen to go and watch Matthew play on a Saturday afternoon rather than Villa. One thing that nearly got me to Villa Park today for their deby against West Brom was the chance to see Shane Long play but decided not to go in the end. What a good decision that proved to be given that Alan Hutton assaulted him and Long had to leave the field after 17 minutes. Disgraceful support from Villa manager McLeish who described the incident as "the ball was there to be won and he did play the ball first"
Roy Hodgson's view which I agreed with was that Hutton's challenge on Long was a very bad one. Precious regard all round for the safety of Shane Long who went off with a bad knee injury and no regard for the fans who like myself might be entertained by Shane Long as opposed to watching a thug like Alan Hutton week after week. Hutton's tackle was an absolute disgrace, diving in at pace with feet off the ground and could easily have done serious injury to Long and removed him from the Premier League all season. Referee Phil Dowd instead of showing a straight red did not even give a free kick because he hit the ball first on his way to smashing into Shane Long's legs.